Autumn has arrived! It has wrapped nature in various shades of colours, it has brought delicious gifts, peace and calm. With pleasant weather and less crowds than during the summer months, the time is just right for you to actively explore Krk’s gems, natural and cultural-historical heritage. Leave all your worries behind, step outside and spend active time outdoors! Hike Krk island trails, with more than 300 km to choose from. Walk through the woods, past vineyards and olive groves of the central and western part of the island, explore the rocky north and south, climb up to the peaks of more than 500 m above sea level, discover the hidden coves and secluded beaches, taking in the beautiful landscape around you. It takes 12 days to pass hiking trails and fully get to know the island on foot. To make it faster, hop on a bike. Hiking trails can be used for cycling as well, which makes Krk one of the best destinations for bicycle fans. Be active or take it easy and visit the unique natural attractions of the island! Step into the extraordinary cave Biserujka with fascinating formations and 6 endemic species. Take a deep refreshing breath as you visit the immortelle (everlastings) farm with the view of Krk Bridge and historical curiosities to learn about. Go birdwatching and watch out for Eurasian griffon in the Kuntrep ornithological reserve in the northeastern part of Krk. Take a walk down the history lane in the wonderful town of Krk, which used to be home to powerful Croatian nobility, the Frankopans. Follow the traces of early Croatian literacy with Glagolitic monuments in Baška, Glavotok, Vrbnik, Omišalj, Dobrinj, the island of Košljun. For the ultimate views and a dash of adrenaline, fly down the Edison Zipline near Baška. 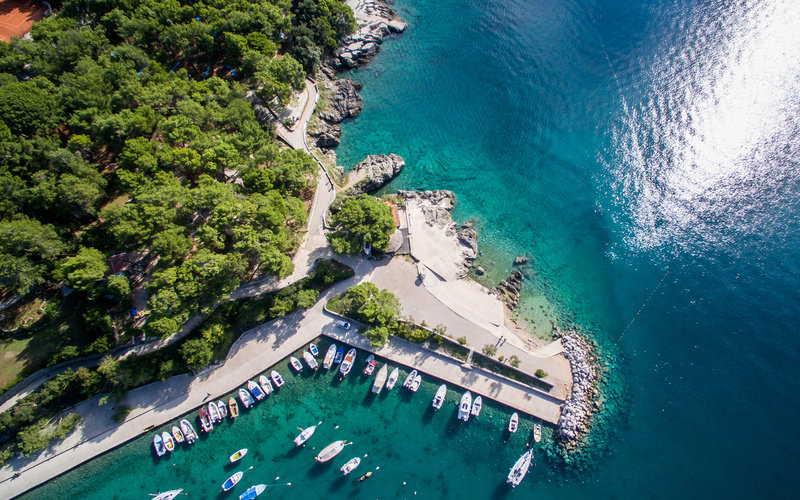 To get to know the extraordinary underwater life, visit the aquariums in Krk or Baška. Visit at least one family-run farm or a small business in the search for unique flavours of Krk gastronomy! Try the exquisite Krk island pršut (prosciutto) and cheese, two delicacies that perfectly reflect the environment and the climate of the island. Also, treat yourself to lamb meat specialties, traditional pasta šurlice, excellent fish and seafood dishes, and a glass of famous Krk island wine - vrbnička žlahtina. As a souvenir, remember to take home some honey and olive oil to remind you of the delicious tastes of Krk. Surprise your dearest with an autumn break on Krk! Rekindle the romantic spark in your relationship by dedicating some time to one another - relax in amazing accommodation such as Boutique Hotel Marina, enjoy delicious food, be active and simply share wonderful moments together. Days may be getting shorter, the sun may be losing its force, occasional rain may happen, but Krk will still take your breath away! So, take some time off and enjoy a fulfilling autumn break on Krk!